keying modulation would all be possible. The satellite processor could accept such input, store the data in memory and later forward the messages in whatever mode the intended receiver would desire. The satellite will be an experimental package on one of several possible spacecraft. It would be in a full-earth coverage orbit with 2 to 4 passes per day appearing at the same time each day. 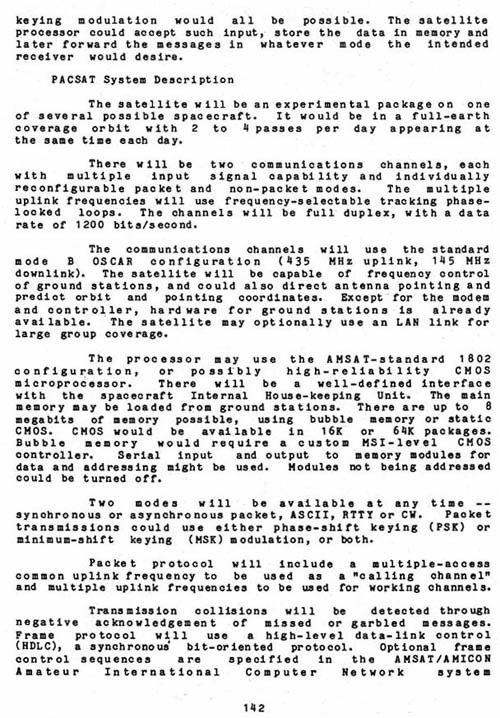 There will be two communications channels, each with multiple input signal capability and individually reconfigurable packet and non-packet modes. The	multiple uplink frequencies will use frequency-selectable tracking phase-locked loops. The channels will be full duplex, with a data rate of 1200 bits/second. The communications channels will use the standard mode B OSCAR configuration ( 435 MHz uplink, 145 MHz downlink). The satellite will be capable of frequency control of ground stations, and could also direct antenna pointing and predict orbit and pointing coordinates. Except for the modem and controller, hardware for ground stations is already available. The satellite may optionally use an LAN link for large group coverage. The processor may use the AMSAT-standard 1802 configuration, or possibly high-reliability CMOS microprocessor. There will be a well-defined interface with the spacecraft Internal House-keeping Unit. The main memory may be loaded from ground stations. There are up to 8 megabits of memory possible, using bubble memory or static CMOS. CMOS would be available in 16 K or 64K packages. Bubble memory would require a custom MSI-level CMOS controller. Serial input and output to memory modules for data and addressing might be used. Modules not being addressed could be turned off. Two modes will be available at anytime -synchronous or asynchronous packet, ASCII, RTTY or CW. Packet transmissions could use either phase-shift keying (PSK) or minimum-shift keying (MSK) modulation, or both. Packet protocol will include a multiple-access common uplink frequency to be used as a "calling channel" and multiple uplink frequencies to be used for working channels. Transmission collisions will be detected through negative acknowledgement of missed or garbled messages. Frame protocol will use a high-level data-link control (HDLC), a synchronous bit-oriented protocol. Optional frame control sequences are specified in the AMSAT/AMICON Amateur International Computer Network	system.